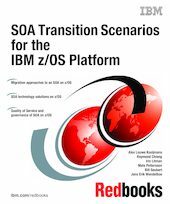 This IBM Redbooks publication focuses on the process of transitioning from an existing IT landscape on z/OS to an SOA-enabled landscape. So if you are a system architect or solution designer and you need to make decisions about SOA enablement or transitioning on the z/OS platform, this book offers an excellent starting point. It describes patterns, transition approaches, migration scenarios, and the features and functions of the available technology options. And specialists who are interested in technical details of the solutions will also find plenty of useful information. Service Oriented Architecture (SOA) is a hot topic on the agendas of many CIOs and architects. But the bright and shining landscape of an SOA, with all the advantages it offers, is quite different from the reality that currently exists in many IT environments; the IT is too complex, too tightly integrated, and too inflexible. The time to market of IT changes is often unacceptably long, and organizations are often not ready for an SOA. And although many IT professionals believe that SOA will make IT more flexible and significantly reduce the time to market, the challenge of how to execute toward a full-blown SOA implementation still remains.This publication will help you to meet that challenge. It helps you define an SOA strategy on z/OS, follow the appropriate implementation steps, and decide what technology to use. Much of the information is applicable to non-z/OS platforms as well.